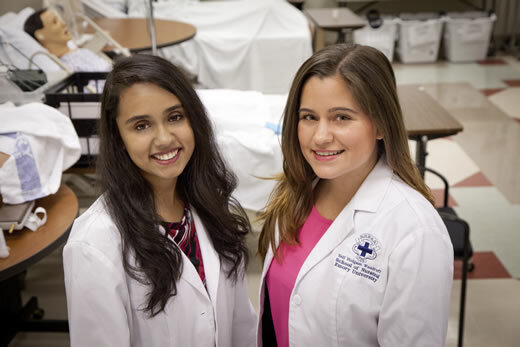 The Nell Hodgson Woodruff School of Nursing at Emory University recently selected Claudia Garcia and Tahsin Rajabali as recipients of its inaugural Susan D. Flynn Memorial Oncology Nursing Externship. This externship is an eight-week long paid immersion program awarded to Bachelor of Science in Nursing students who plan to pursue a career in the field of oncology nursing. The program, established by Frederick C. Flynn, Jr. in memory of his wife, who died of ovarian cancer in 2013, is designed to help develop the next generation of oncology nurses. Through a comprehensive program of direct observational and learning experiences at selected sites at Emory Healthcare and Children’s Healthcare of Atlanta, and under the mentorship of experienced oncology nurses, the program enhances the students’ clinical experiences in the critical field of oncology. The aim is to foster the career interest and professional development of aspiring oncology nurses. "Real life, on-the-ground training is crucial to the understanding of patient care," says Susan Shapiro, PhD, RN, associate dean for clinical and community partnerships. "It is through opportunities such as this, coupled with the first-hand mentorship from veteran oncology nurses, that equip our students for a successful career in nursing. We are delighted to have the opportunity to participate in this unique nursing education program and we value our new partnership with Mr. Flynn." Both nursing students will commit to full -time work from June to July 2015. By the end of 2015 Flynn plans to expand the program to include a total of nine leading cancer care hospitals and nine of the country’s top undergraduate nursing schools. "I am pleased to add Emory's Nell Hodgson Woodruff School of Nursing as a program partner and look forward to working with this leading institution to help develop the next generation of oncology nurses," says Fred Flynn, Jr.